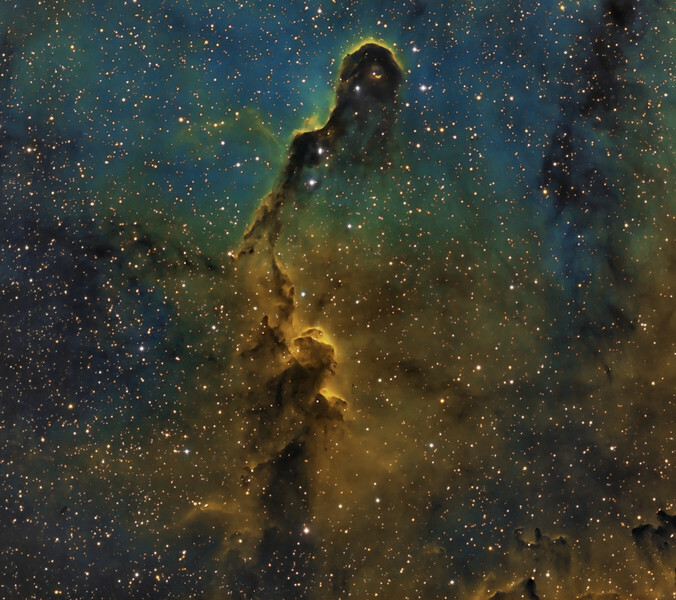 Elephant's Trunk Nebula in IC1396. Done in Hubble palette with narrowband filters to highlight emissions of Hydrogen, ionized Sulphur and ionized Oxygen. Ha binned 1x1 12x20m, SII binned 2x2 10x30m, OIII binned 2x2 10x 30m. Total of 14 hours of exposure. Taken by Lynn Hilborn WhistleStop Obs,Grafton, Ontario in July 2011. Editors' Choice Sky&Telescope magazine Photo Gallery. TEC 140 @f5.6 and FLI ML 8300 camera with Baader filters, Tak NJP mount.